“Horns” is a movie about a very unlucky guy who is accused of murdering his girlfriend, quickly cast down as a town pariah, and then wakes up one morning to discover two devilish horns growing out of his forehead without reason or explanation – although they do inspire everyone around to confide their deep dark thoughts. If only the audience were spared the exhausting nature of this mystifying predicament. Somewhere in the creative trenches of writer hell, I am sure there are filmmakers out there sifting through screenplays like this that are genuinely capable of funneling crazy material into something resembling a dedicated vision. But under the influence of director Alexandre Aja, what we get here is two hours of maddening, thoughtless exercise with misplaced assumptions; seeing it, one is left with the impression that all those involved were too committed by novelty in order to detect the necessity for some level of modulation. Indeed, an idea seeped in supernatural metaphors often requires a mind more honed into the mood of those implications in order to make them relatable to an interested viewer. This is the kind of movie that seems clobbered together under some sort of delusion that editing fixes all things, including a director’s detached sense of execution. Even that impulse might work if the movie camera had the most basic grasp of what reality it was working within: our own, one resembling our own with subtle shifts in logic, or one that plays like an outright union of vivid nightmares. Explanations then become the bridges that carry us into those realms. But “Horns” is so thoroughly enamored by its bizarre sense of novelty that no one – least of all the writer – is eager to provide a tangible means at which we can understand the core motivation. Is it weird just for the sake of being weird? Is it a morality play about the necessity of darkness in discovering the truth about events and ourselves? Or is it just another run-of-the-mill murder mystery using more creative masks to settle the formula? The film’s failure to be decisive with one clear goal only intensifies the insufferable quality of watching it all convulse around on the screen. There is a moment late in the picture where one almost envies the position of the deceased – because at least she has been provided some level of escape. The premise, extracted from a fairly popular novel, offers intriguing possibilities in the early stages. At the opening of the picture, we are introduced to a charming couple of young love birds in a quirky camera shot at a picnic in the forest: Iggy (Daniel Radcliffe) and Merrin (Juno Temple), lovers who have we sense weathered a lengthy tumultuous journey up to this one particular moment. “I will love you for the rest of my life,” he concedes. “Just love me for the rest of mine,” she chimes in. Instantly, her words foreshadow a bleak reality that is not far from being unleashed onto us, and in the next moment Iggy is rushing down the stairs of his apartment as he is bombarded with the local press. Merrin, it seems, is now dead, and Iggy has been fingered as the likely culprit in her untimely demise. What exactly happened to cause her death is not directly revealed until much later, but this much is apparent right from the start: it was of a very violent means to which she met an end, and her still-alive boyfriend retains the faith of his close family, who huddle around him in an uncertain time as he continues to profess his innocence. There are usually only two direct reasons a camera will follow around a character accused of murder: either he really is innocent and we are curious to see what lengths he will go to prove it, or something significant about him will alter the perceptions of the audience. 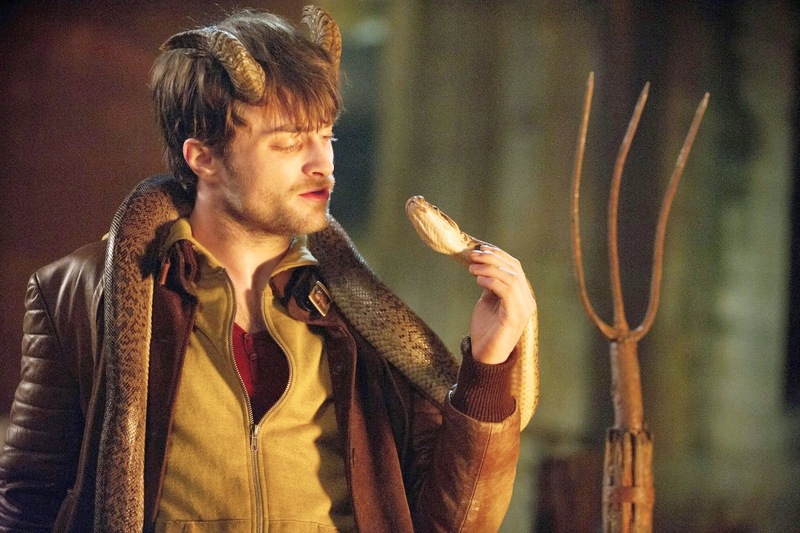 Twenty minutes into “Horns,” a reveal occurs so utterly bizarre that I was secretly wishing for the ever-dependable split personality twist instead. What is it? The title is your clue; without no inkling or suggestion, Iggy wakes up with pain shooting through his temple, and two rough knobs resembling small horns protruding from underneath the skin. So amazed and perplexed by their appearance – no doubt because they would, indeed, look rather suspicious on a guy who has just been accused of killing his girlfriend – he is even more bewildered by the reactions of others. Not a single person in the movie feigns any insistent shock or wonder; they don’t have time, because as soon as their eyes meet them, Iggy becomes their unwilling listener as they divulge grizzly details about murder fantasies, deplorable ideals – you name it. The screenplay by Keith Bunin (himself very new to film) is obsessed with these details as if embellishing on the suggestion that the horns themselves are a magnet for the negative energy of all those around him. Later, it’s exactly that particular facet that gives Iggy the leg up in discovering the true nature of his girlfriend’s death; using the dark confessions of others, he inches closer to discovering the identity of Merrin’s killer, and ultimately descends further into his own sense of hell in order to solve the mystery. Or something like that. “Horns” is a lot about guesswork; because the camera is absorbed in the distinction of one key image – that of the hero sporting a couple of very unattractive horns – it never spends time establishing anything else, essentially because it doesn’t see the need for it. Watching the movie, one gets the impression that Aja, the director, adopts the conceit that he is a conductor at some sort of macabre visual symphony, except that he hasn’t the slightest clue as to how to orchestrate anything into something of precision. His failure is not ultimately what gives “Horns” such a repulsive aftertaste, though; no, that more dubious honor belongs to Bunin, who wrote the screenplay and has provided all those involved a treatment so uninterested in any sense of coherent pacing or storytelling that all we get is an endless series of moments centered entirely around eccentric conversations and displaced flashbacks of happy childhoods (including the full story of how Iggy and Merrin came to be). Some would argue that such deliberate insanity is not capable of coming through the film translation with any sense of structure, but I beg to differ – Terry Gilliam’s brilliant “12 Monkeys” did exactly that, and not necessarily in a way that sacrificed the underlying schizophrenia of the narrative or the visual style. You would at least think a more seasoned director of psychological thrillers like Aja (who did “High Tension”) would detect this possibility, but who knows – maybe he just resigned in silent protest and just worked with what he had. If the very nature of the film is as baffling as it is annoying, then Daniel Radcliffe’s own presence provides an added facet of unfortunate realization. So eager to shed the skin of his Harry Potter years, here is a guy who now seems to be caught on a dangerous trek through the doldrums of laughable movie nightmares; after the uneven “The Woman in Black” and the very miscalculated “Kill Your Darlings,” Radcliffe’s participation in “Horns” is indicative of a man trying way too hard to establish a new name for himself on screen. Perhaps I’m just more sold on conventions, but why couldn’t he just do a comedy? Or better yet, why can’t he just offer his services to something a little more straightforward, however dark? Despite the intense suggestion of imagery here, this is a film far beneath the capabilities of such a gifted young man who displays such eagerness for eccentric subjects. The rebellious nature of movie stars afraid of typecasting is one of the more frightening double-edged Hollywood swords, yes, but someone ought to remind him that there’s a fundamental difference between taking risks and jumping the shark. Who was this movie even made for? Supernatural thriller buffs? Avid observers of serial killer character studies? Cult types who think this is all acceptable as satire? The indecisive mood of “Horns” is only underscored by the seeming disinterest of nearly all those participating in it on-screen (except for Radcliffe, who works his way through it as if refusing to admit defeat). That any of them manage to make it to a climax at all is remarkable given the listless momentum of it all, but by then, inevitably, there’s another offense waiting: a conclusive act so over-the-top and silly that one wonders if anyone standing behind the camera was even keeping a straight face during the take. Years ago, in the hearts of filmmakers who saw the humor of their maddening ways in these genres, we as viewers had the opportunity to share in their overzealous glee (think of the early Sam Raimi pictures). It’s fun to get lost in absurdity. That assumes, however, that any level of ridiculousness is conveyed with tongue-in-cheek intent, or something equally firm. None of that permeates from the wreck that is this movie, which seeks only to inspire one emotion in all of us: that of utter indifference.